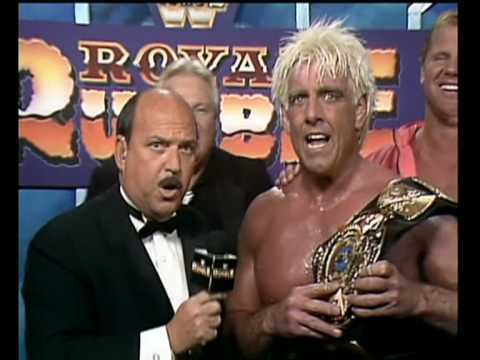 20 YEARS AGO ON JAN. 19TH 1992 IN ALBANY, N.Y. AT THE "WWE ROYAL RUMBLE PAY PER VIEW "NATURE BOY" RIC FLAIR DEFEATED 29 MEN IN THE GREATEST ROYAL RUMBLE MATCH IN HISTORY TO WIN THE "VACANT" WWF CHAMPIONSHIP. IT'S STILL THE ONLY "ROYAL RUMBLE" MATCH TO BE CONTESTED FOR THE WWF CHAMPIONSHIP IN THE COMPANY'S HISTORY. THERE ARE SEVERAL REASONS AS TO WHY THIS MATCH STANDS OUT IN PEOPLE'S MINDS AS THE BEST "RUMBLE" MATCH EVER. IT PROBABLY HAD THE BEST ROSTER OF TALENT OF ANY RUMBLE MATCH IN HISTORY, AND IT WAS IN NEW YORK WHICH WAS BASICLY WWE'S HOME FOR SO MANY YEARS BUT WHAT REALLY STANDS OUT IN THIS MATCH AS IT FEATURED THE GREATEST PERFORMER IN THE HISTORY OF THE BUSINESS (RIC FLAIR) IN HIS FIRST BIG MATCH IN THE WWF. 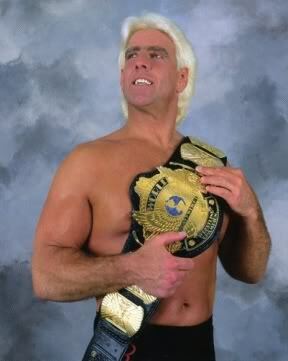 AS MOST FLAIR FANS KNOW UP TILL THE FALL OF 1991 RIC FLAIR HAD BEEN IN THE NWA FOR 17 YEARS STRAIGHT, WHEN HE LEFT TO GO TO THE WWF IT SHOCKED MILLIONS OF WRESTLING FANS ALL OVER THE WORLD WHO THOUGHT HE WOULD NEVER LEAVE TO GO "UP NORTH" BUT HE DID JUST THAT AND WHEN HE DID WRESTLING FANS COULDN'T WAIT TO SEE WHAT HE WAS GOING TO TO IN THE WWF. 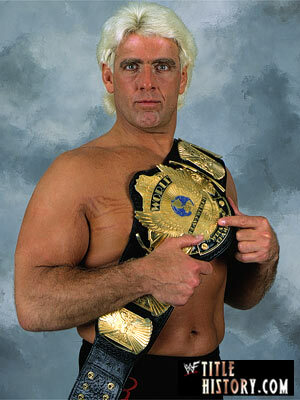 UPON HIS ARRIVAL TO THE WWF THE NAITCH CALLED HIMSELF "THE REAL WORLD'S HEAVYWEIGHT CHAMPION" (WHICH HE WAS) BUT THERE WERE LOTS OF DIEHARD WWF FANS WHO DIDN'T BELIEVE HIM BECAUSE THEY HAD RARELY WATCHED "THE MAN" IN THE NWA SO EVEN THOUGH FLAIR HAD ALREADY ACHIEVED MORE THEN ANY OTHER PERFORMER AND HAD THE GREATEST CAREER IN HISTORY UP TO THAT POINT HE STILL HAD A LOT TO PROVE TO THE "TRUE BLUE" WWF FANS, AND "THE NAITCH" WAS ON A MISSION TO DO JUST THAT. 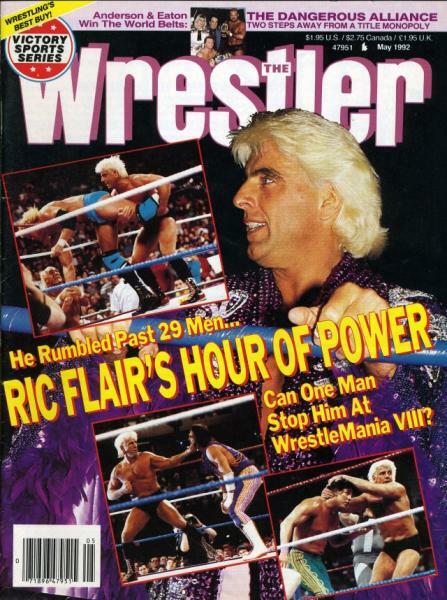 THAT IS WHAT BRINGS US TO THE 1992 ROYAL RUMBLE, FLAIR HAD A LOT TO PROVE AND ON THIS DAY HE PUT ON ONE OF THE MOST SPECTACULAR PERFORMANCES IN THE HISTORY OF THE WRESTLING BUSINESS AND PROVED TO THE WWF FANS THAT HE WAS EXACTLY WHAT BOBBY "THE BRAIN" SAID HE WAS AND THAT IS THE "REAL WORLDS HEAVYWEIGHT CHAMPION." 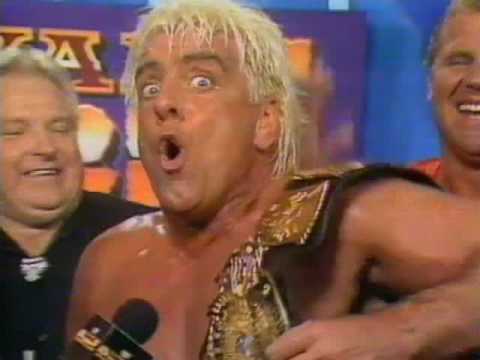 FLAIR ALWAYS CLAIMED HE WAS THE "60 MINUTE MAN" AND ON THIS DAY HE WAS EXACTLY THAT AS HE LASTED IN THE RING FOR OVER A HOUR TO TAKE HOME THE TITLE. YOU ALSO CAN'T MENTION THE 1992 ROYAL RUMBLE WITHOUT MENTIONING THE AWESOME ANNOUNCING JOB THAT BOBBY "THE BRAIN" HEENAN AND GORILLA MONSOON DID ON THE MATCH. I WAS PERSONALLY NEVER A FAN OF MONSOON ALTHOUGH HEENAN WAS FANTASTIC BUT THE CHEMISTRY THEY HAD TOGETHER ESPECIALLY CALLING THIS ROYAL RUMBLE MATCH WAS ABSOLUTELY SUPERB.